This modern family home exudes raw, contemporary style with a focus on natural elements. The result? Simple perfection. Having built their Perth home in 2016, Erica Zuccala and her husband Peter, together with their children Aniela and Dominic, have been happily living the dream ever since. Their abode is a comfortable and inviting space, creating an intimate family sanctuary that is also ideal for entertaining. Starting with a crisp white base on the walls, Erica has expanded on her neutral colour palette by incorporating grey concrete render to the living room wall and external concrete floors, as well as matte black accents on tapware and handles. In contrast, grainy timber furniture, woven pendants, textured rugs, and soft furnishings with muted tones were chosen to add warmth to the interior. 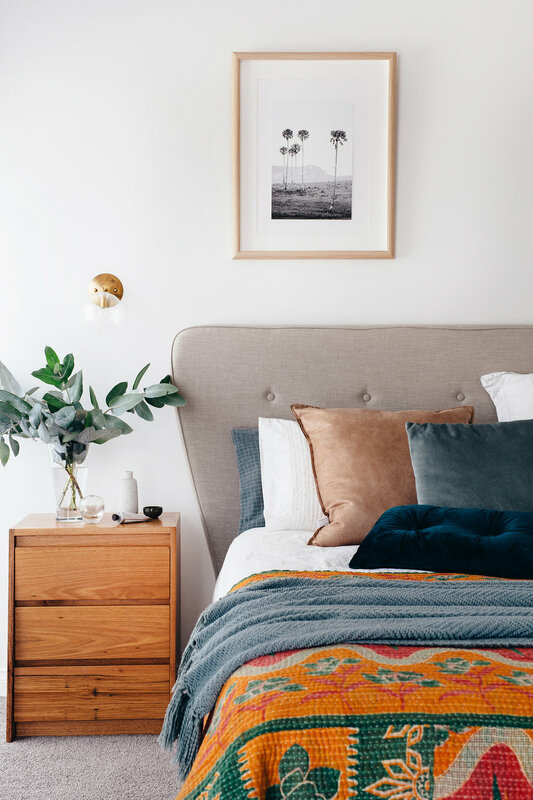 Erica used different treatments on the walls for interest, including wallpaper (the stunning wallpaper in Aniela’s room is from Origin Wallpapers), timber panelling and renders, and decorated with moody photographic art as well as eclectic and handcrafted pieces. Large windows allow natural light to flood the home, giving a bright and airy feel that is softened by flowing, sheer curtains. In fact, one particular window creates one of the home’s standout elements: deciding against a statement splashback in favour of a highlight window, the family have made the garden outside a feature of the kitchen, blurring the line between indoors and outdoors. 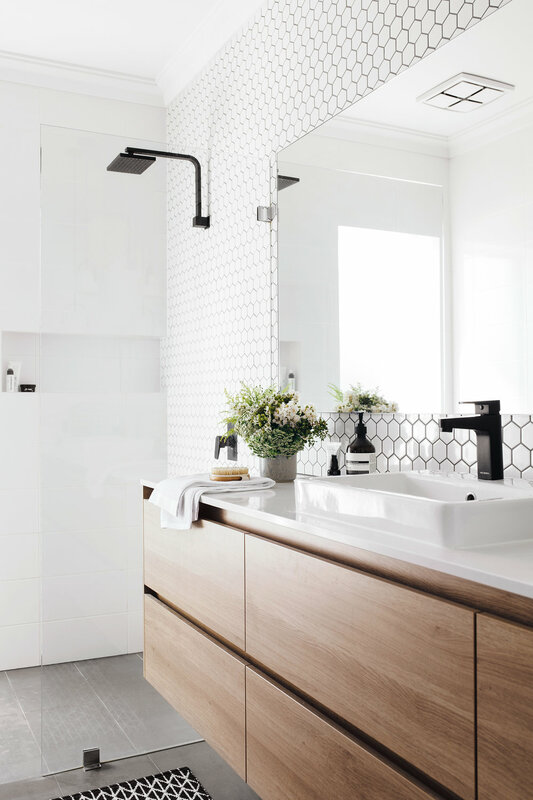 Likewise, small details make a big impact, such as laying the kitchen subway tiles in a herringbone pattern with a contrasting charcoal grout and opting for textured timber plank tiles over timber flooring. “We’ve had solid timber before but, with young children, we wanted to move towards something that could handle the traffic and wear and tear, without the maintenance. I wanted a rustic, earthy base to warm up and tone down the coldness of the white walls,” says Erica. Mon Palmer was hired to design the outdoor space. “The brief was to create a contemporary, oasis-style entertaining area that incorporated a pool. Being a small space, this was a challenge, so it was important that we selected the right designer. Mon is the queen of plunge pools and resort-style exteriors, so this was a no-brainer for us. We love her use of concrete and her plant choices,” says Erica. Greenery has been carefully selected for the home to ensure it thrives in its given location. Erica advises that Euphorbia succulents work well for indoor areas with low light, while Monstera and Dracaena are ideal for well-lit indoor areas. Having loved plants since childhood, Erica feels a great sense of achievement in maintaining a thriving garden. With a small backyard, Erica and Peter chose to work with Mon Palmer, who is known for creating exceptional modern outdoor spaces. Given a brief to design an oasis-style entertaining area that incorporated a plunge-pool, Mon excelled. “We love her use of concrete and her choices in striking plants. The whitewashed herringbone privacy screen planted with Madagascan Jasmine creeper creates a total wow factor – it grabs attention before you even step outside,” says Erica. Which is no small feat in a home that’s high in wow factor, inside and out. Want to see this home in print? 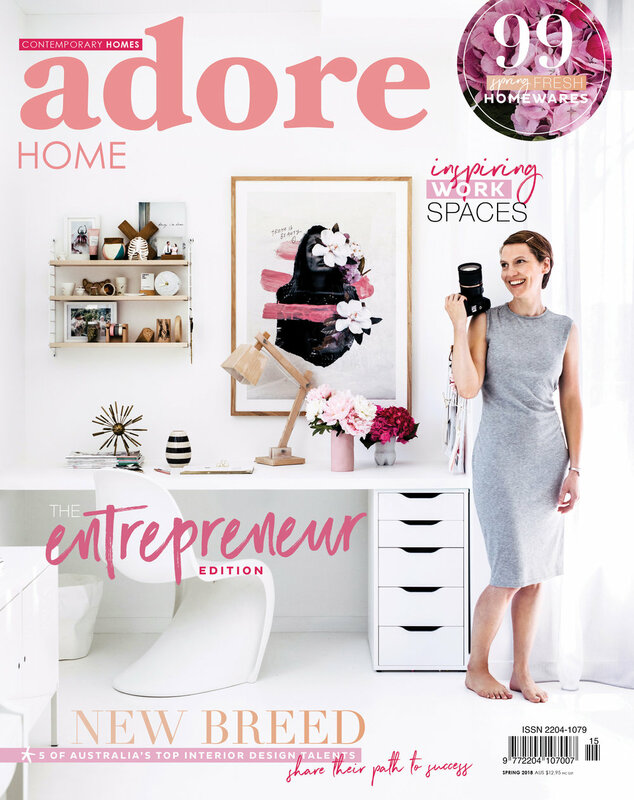 You’ll find this home tour in our Entrepreneur edition, available in newsagents in Australia and through our online shop. Click here to buy.